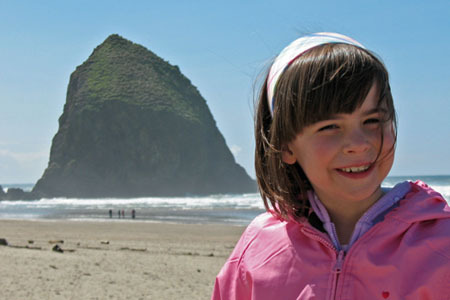 In early April, over my spring break, we drove in the RV to Cannon Beach, Oregon. We stayed at the Cannon Beach RV Resort, which had an indoor, heated swimming pool; for two days I played a lot of Marco Polo there with other kids The weather forecast had been for cold and clouds, but the sky was perfectly clear when we woke up the first morning. It was chilly in the wind on the beach [left], but walking around town was warm enough that Mommy even bought me an ice cream cone! I liked Cannon Beach, and I'd like to go back when it's warmer. We also spent two days visiting Dave and Jeanne in Portland. They're always really nice to me, and we spent Saturday driving through the Willamette Valley countryside and checking out pioneer days at a horse-drawn plowing contest. But my favorite part of the trip was visiting with Jeanne's chickens: waking them up, holding them, feeding them, checking for eggs, and putting them to bed. I want to have a chicken coop at home! I participated in my first science fair at school. Mommy and Papa helped me choose a project: "The Naked Egg." For that, I stored an egg in a jar of vinegar for 36 hours and watched what happened. (Mom took photos every 12 hours.) What did happen is that the vinegar dissolved the outer eggshell (releasing carbon dioxide bubbles, calcium acetate, and water during the process) but left the inner membrane intact. When we took it out of the vinegar and dried it off, we could see the yolk inside by shining a light behind it. That was pretty neat! Papa helped me organize the display board, but I did all the typing myself. 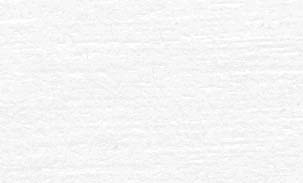 Then Mom helped me format the text with Word and print it out. We glued all the pieces on together. We put up the display in the gymnasium with a naked egg and a light to look through it [right]. 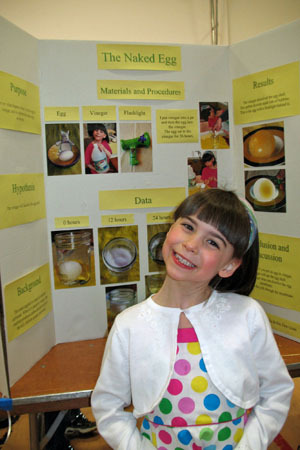 About 100 other kids did science projects, too. During the school day all the kids walked through the gym and looked at the projects. Then that night the parents came to look at them all. Everyone who participated got a certificate and a ribbon. I had a lot of fun! The Sunday before Easter, our neighborhood had its annual "Spring Hop." Mommy always contributes to that. She baked cookies and helped hide all the eggs in the grass, the bushes, the trees, and the rock wall (most were pretty easy to find). Nineteen kids from our neighborhood came out, and when Miss Lynette said, "Go!" we all ran like cheetahs after springbok to fill our bags and baskets with our quota of eleven. After the dash and grab, we had a relay race with eggs, spoons, jump ropes, and tricycles. We also played tag and hide and seek and ate baked treats. All that fun made me really excited for Easter to arrive! Last Easter I was in Holland, away from Mommy and Cameron. This Easter I was back home again, and even Cameron was home from his fraternity. I went to bed the night before willingly because Mommy reminded me that the Easter Bunny ("E.B.") would not visit unless I was asleep. But I was so excited that I woke up at midnight, sure that I'd heard E.B. walking around downstairs, and again at 3:00 in the morning! I finally got up at 7:30, but Mommy and Papa wouldn't let me go downstairs until 8:00, when they agreed to finally get out of bed! The Easter Bunny did come, and he left eggs hidden around the house and baskets for me and Cameron at the kitchen table. My current theory about E.B. is that he's not a real rabbit. That's because a real rabbit doesn't have hands or fingers to make chocolate or carry baskets. Instead, I'm pretty sure that E.B. is a person in a bunny suit. My basket had lots of neat stuff in it [right]: Pokemon cards, colored bubbles, Easter socks, a Bananagram game, pencils, a paper pad, two books on bugs, sparkly tatoos, and fuzzy chick that cheeps when you hold it in your hand. 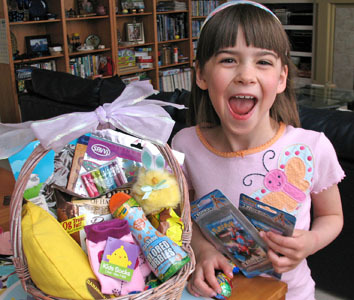 It contained candy, too, of course: a large solid chocolate bunny, chocolate-covered Peeps, yogurt-dipped pretzels, and four Cadbury cream eggs. Yum! After Cameron got up (he always sleeps in these days! 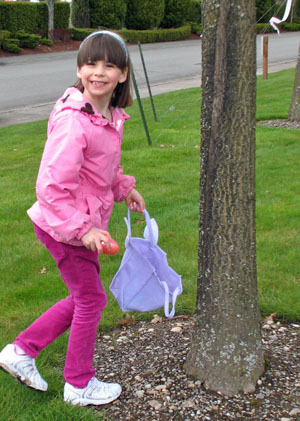 ), we hunted for the colorful plastic eggs that E.B. hid all around the house. We each found 52, and all of them had a candy inside! Grandpa came for brunch about 11:00, and we had a good meal and a nice visit. After he left, the day was quiet (unfortunately, rainy and cold outside), but I had a great time mostly playing with all those empty plastic eggs. The day after Mom's 50th birthday, we flew to Disneyland. I was so excited! The first afternoon we spent at the Castaway Cove water park at the Howard Johnson hotel where we stayed. While Mom and Papa relaxed in recliners with books, I played for three hours in the sun (what a change from Seattle!!) and water with lots of other kids and had a blast. We spent two days at Disneyland, separated by one day at California Adventure. 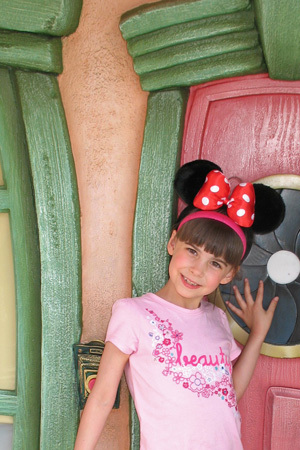 In Disneyland, I rode all the rides that were open (Splash Mountain and Star Wars were closed), big and small. Some of my favorites were It's a Small World (Mom says she can only do that once because of the music), Space Mountain, the Matterhorn, and Thunder Mountain Railroad. I also loved the Buzz Lightyear Astro Blaster, even though Papa beat my score the second time. We saw the Captain EO Tribute, but I didn't know who Michael Jackson was, and we rode Pirates of the Caribbean twice, but Mom had to point out Captain Jack Sparrow. I really liked sailing on the two ships: the Mark Twain paddle wheeler and the pirate ship Columbia. I also liked the adventure boat safari, but I didn't like the Indiana Jones ride (the idol scared me and it was too jerky). ToonTown was really fun; I liked touring the characters' houses and the Roger Rabbit ride. In New Orleans Square I ate a Mickey-shaped beignet and danced on stage with a Dixieland band. I also met Winnie the Pooh and Eeyore. We ended our first night by watching the Disneyland fireworks from the hot tub of the Howard Johnson hotel. 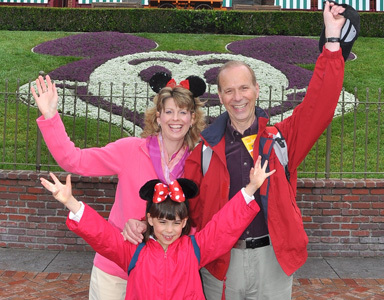 Mommy and Papa had never been to California Adventure, either. We had a great day there. We went on several of the rides at Paradise Pier, but the best, of course, was the California Screamin' rollercoaster. I think it was Papa's favorite in the park; he and I rode at the very front!. We went Grizzly River Rafting, getting wet early in the day. And I climbed my way through the Redwood Creek Challenge Trail over ropes, rocks, and walls. I liked the Muppet Show, although I'd never seen Muppets before, meeting the Cars Lightning McQueen and 'Mater, and walking through the magical Bug's Land, where all the surroundings make you feel small as a bug. Our very first ride was Mommy's favorite: Soarin' over California. My favorite was one of our last: the Hollywood Tower of Terror! I loved the big drop!! On the night of our California Adventure night, we met Mom's friends Elisabeth and Evan for dinner. They drove all the way down from San Jose to help her celebrate her birthday. Our last evening, after cramming in every final ride we could, we walked back to California Adventure to watch the Colors of the World display. It was a long wait and a bit cold, but all the lights, movies, water, and even fire were really amazing. Although we'd had three very long days and our feet were tired, the whole weekend was a blast. I can't wait to go back again!! !